Biblical Principles For Everyday Issues--3 Years Now Complete! For 10th-12th graders. This comprehensive study is full of scripture. Students have to search their Bibles to find the answers. "What's Up With That?" covers issues affecting teenagers. "Versus vs. Verses" helps students choose a side in match-ups like Spiritual vs. Worldly. "Back For The Future" looks at "present" day issues and studies a relevant Bible story from the "past" to see how these principles should affect our "future." "Lord, I Need Your Help!" 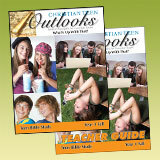 encourages teens to turn to God for help in times of need. "Identity Crisis" covers issues teen struggle with when it comes to their identity. Discusses whether teens are letting their surroundings define who they are. "The Royal Reality Show" examines some of the kings of Israel and Judah and helps teens learn where decisions can lead them spiritually. "Pay Attention!" helps teens learn from some of the extreme cases of God using His power to make an example out of someone. "Are You Talkin' To Me?" helps teens uncover the meaning of some of Jesus' parables. "They Were MY Age?" examines the lives, accounts, and examples of some of the Bible's young people and what they have to teach our teens today. "Stuck Like Glue" spotlights some interesting relationships in the Bible. "We've Got Issues" shows what the Bible says about handling some important issues like religious pride, worship, and forgiveness. "Crossroads" helps teens handle situations they encounter involving important decisions in their lives. This exciting new series is now complete!